Is It Possible That Material Factors in Nature Come Together and Create Living Beings? Our article, 8-9 November 2018 Nenehatun Cultural Center, Atatürk University Campus The second International Congress of Creation in Erzurum is the full text of our presentation. The purpose of study is to clearly reveal out whether it is possible for the material factors in nature to come together and give life to things. Firstly, basic concepts such as “coincidence, material factors, the laws of nature, the mechanisms of evolution”, on which the existence of the material and the formation of an object is based, will be discussed and their features will be analysed. The end of the analysis: It will be basically found that, it would be a non-scientific, difficult and vague way to try to explain the creation of an object through material factors and nature or by claiming that it has come out by itself. This study will contribute to the determination of the fact that it would be more scientific, reasonable, rational and acceptable to explain the creation of an object with a Creator, as an alternative possibility involving required conveniences and that, if there was a scientifically acceptable model, such model would better deserve to be scientifically accepted. Since the middle of 19th century, some scientists have started to develop certain theories both in order to explain the existence of the universe and the matter/objects/materials; and to base the formation of living and non-living creatures, materials and objects in different shapes and types depending on the movement and functioning of the matter, on scientific causes. In these claims, which are called in general as naturalist and materialist philosophy, it is attempted to explain the existence of the matter and the formation of objects on three basic reasons. 1- Material causes in the nature. 2- The characteristics of the matter and objects, which exist in themselves as their characteristics, stemming from themselves. In order to better comprehend the functioning of the matter/object, the claims of the naturalistic thinking and the evidence provided in this work, now let us have a look at the fundamental concepts, know and understand what these famous things, which are called as “nature, coincidence, causes and laws”, are in reality and what they are not. First, we start with the most famous one. What is nature? Here what it means literally: -the universe and everything inside it – material world –the laws that maintain the order in the universe – the fundamental characteristics of an object. It is clearly seen that, what we call as nature is not something different and other than living and non-living objects we see around ourselves. It is just an abstract concept, which is invisible to eyes, used to describe the totality of all these things. I am the nature, so you are. Everything you see around yourselves is nature. There is no such nature to which you can say “Come on, Nature, why don’t you give me an apple?” You are talking about the universe itself. Then, what does this mean? Let us remember the definition of nature made at point 3 above. “Nature means all existing matter and objects and the way they behave in different situations”. Just like the word “humanity” which is used to express all human beings. The concept of humanity is composed of the totality of all human beings and it does not have an external concrete reality of its own. Once we understand the fundamental concepts, the problem starts unfolding and manifesting itself. As following: Explaining the existence and functioning of the matter/objects around us with the concept of nature, trying to explain it in that way or assuming that you are explaining it in that way; This is not more meaningful than trying to reply the question of “Why is it like that?” with the answer: “Since it is like that”. In other words, this is explaining something again with itself. Not looking for an exterior cause. How meaningful is this? One thing will be both “creator” and also the thing which is “created”. “Something, while even not even existing, has created itself ‘on its own’!” Now you should decide how logical such a sentence sounds. We should say that; a successful propaganda machine was used in showing this nonsense to people as real. This is the power of promotion, propaganda and speculation. Laws of nature are names given to the principles of the action/movement of the matter/object, which act/move continuously in a certain orderly way, which can be determined due to this order in their actions/movements. Although the law of nature is a concept which does not have a material body, it just serves to express how the matter/objects act, move. 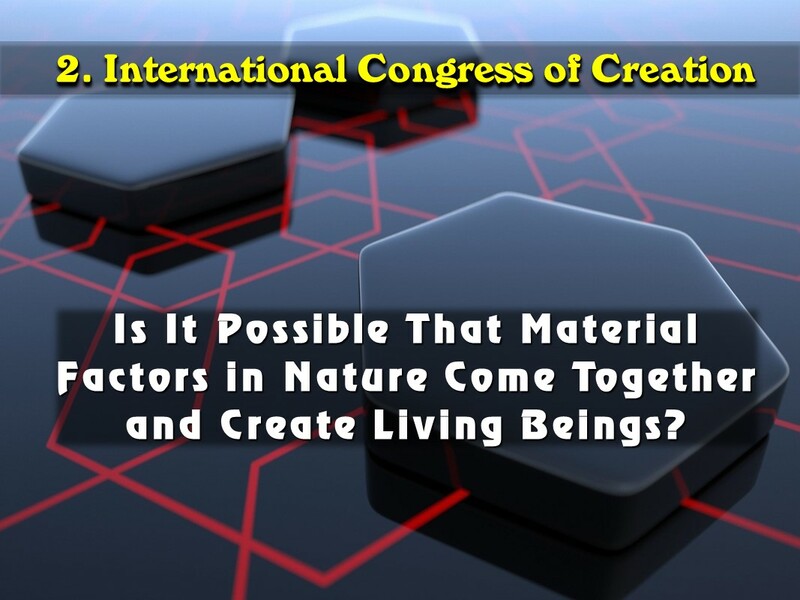 In first Creation Congresses presentation called “The Scientific Compliance of the Thought of the Existence of a Creator and the Laws of Nature “, four significant presentations which are like cornerstones and science manifestos are introduced. You can read from the following addresses. In a model of universe, which is created by a creator, “intelligent design” is an important concept and argument. How can we know that an object is designed or not? Design is putting together more than one piece in an orderly way to achieve a certain purpose. Whatever has these characteristics, we call it intelligent design because they can’t be done accidentally. When looked at from this perspective, a passenger ship in the sea, or a high-speed train working in the land, all are complex designs made up of many pieces which are brought together in an orderly manner. When we look at all living things, we see the characteristics of intelligent design exactly and excellently. Let us have a look at the wings of a bird: for the purpose of flying, there are hollow light bones, strong pectoral muscles that can move these bones and fathers taking hold of the air; wings that are aerodynamic, i.e., able to continue the movement in the air as planned and a metabolism which can meet the need for high energy. You know about the immigration of birds. They go to very long distances, without any break for refuel, without eating or drinking anything they stay up in the air for very long periods of time. From whichever point you have a look at it, this is a result of an intelligent design, and this is the most reasonable explanation. This is our opinion. Design, on the other hand, necessitates a designer. Besides, whatever or whoever that is accepted as a designer should have the necessary qualities and characteristics to be able to that design. Otherwise, your claim can’t be taken seriously. If you claim: “I have drawn that picture” and if you do not have a talent, then your claim is not more than empty words. And, to be able to make a design, it is necessary to have this triad of knowledge, will and power. In other words, you should know how to do it, you should choose to do it and you should have the power to do it. Now, let us have a look at the existence of the matter/objects, the material causes upon which it is attempted to base their existence and the concept of coincidence. Our well-known “coincidence” is at least as famous as nature. These concepts have taken the place of the creator. Let us have a look at the lexical meaning. Coincide, or coincidence is the realization of an event when it is never planned or expected. That is to say, in coincidence, there is no plan which is previously made. There is no purpose. Therefore, there is either no benefit expected to be achieved. In other words, our famous coincidence does not have a will or conscious. It does not have any characteristics of doing a work, on purpose, being aware of the things and by communicating, jointly by coming together. If you tell me something I can hear it, and if you move your hand, I can see it. But our famous coincidence is blind, deaf and lifeless. That is to say, it is so incapable that you would say “ah, what a pity!”, just as nature and reasons/causes are. Those who do not believe that Allah could create everything and those who have difficulty in believing in Him; see the creation a result of these incapable “reasons, nature and coincidence”. As if they deserve it more! As if it is easier for them to create. Now let us have a look at the material reasons that are brought forward. These are water, sun, wind, force of gravity, electromagnetic force, soil, heat, cold and similar things. When we look at the properties of all such reasons, we can see that, they are unconscious, they can’t do anything on purpose, they do not have a will to make any choice; they are in mess, without any purpose and lifeless. However, it is so interesting to see that, when we look at the effects that are claimed to be the results of these reasons/causes, we see a different picture. We see orderly, artful, wonderfully designed, amazing products. This is astonishing. How come is this possible? Therefore, it seems that there are two ways. Either we will look for an explanation for the existence and functioning of the matter/ objects existing within the universe. Or we shall assume/accept the existence of a secret handler who has an effect over the matter but who is not part of it. Intermediary Note on the Concept of “Coincidental Formation”: It can be said: “However, in scientific theories and explanations, it is not told that life was coincidentally formed. Everything is based on certain concepts and mechanisms”. If there is such an objection, then our response is as following: Whatever the name and the mechanism proposed is, whether nature, evolution or mutation, if these were conscious matters/material objects which could perform a work by planning and preferring; then making any explanation based on these factors could be considered as irrelevant to coincidence. Since material causes are lifeless, likewise, they are things that act in an unconscious, ignorant, and unplanned fashion without any willpower. Our position is so clear indeed. Nevertheless, however hard you may try, you can’t paint the imaginary fictions with the colour of the truth. The fact that processes and material causes lack the capability to create the results themselves necessitates the search for another external reason affecting the events. Then of course, attributing (the reasons of existence) to these ignorant, unconscious, powerless matters, even to laws of nature, which do not have any material existence, not being more than the explanations of the emerging events, and to evolutional processes; would not have a meaning other than randomness, spontaneity and coincidence. Now, we will examine whether it is possible for material causes in the nature to come together and to form/create the living beings and the liveliness. First Point: What are the characteristics of the event taking place or the object being formed? Is it something simple? Or is it something complex? Is it something done with measurement or something ordinary, that could happen or be formed accidentally? Sciences like medicine, biochemistry and biology are written and approved expressions of the fact that elements, which are building blocks of living beings, are brought together in delicate and specific measurements and working in a very systematic order. It is not necessary to give all the technical details of scientific data which can only be fully explained in many volumes of books. But still, you had better go to the internet and type “The Basic Components of Living Beings” or “Chemistry of Living Things” in a search engine and see with your own eyes how complex, detailed, precise and systematic is the structure in which living things are formed in certain precise measures. We strongly recommend this. The results are really exemplary. You will much better understand what you are dealing with and on which you are trying to make a decision. You will understand much better how daring the words of people who claim that the living things are self-created, accidentally or through unreal mechanisms working coincidentally and how such people are lying to you. That’s why we would like to ask you to have a look at this topic online. We want you not just to think without doing any research. The tissues in our body are composed of oxygen, hydrogen, carbon and nitrogen. In teeth and bones, the calcium is predominant. These five elements make up 98% of our body weight. Other elements such as copper, iron and zinc are present only in low quantities, but they are vital in terms of staying healthy. Percentages of elements existing in the human body are as follows: Oxygen 65%, carbon 18%, hydrogen 10%, nitrogen 3%, calcium 2%, phosphor 1%, and other elements 1%. Second Point: Does the thing, which is shown as the real cause of the event happening or the object which is formed, have features and qualities that are able to bring about this event or object? (Let us remember the characteristics of nature, coincidence, laws and causes that we have just reviewed and that they do not have such characteristics). Now, we are trying to analyze this issue. The fact that a cause has qualities bringing about the result does not suffice by itself and it does not mean that the cause brings the result into being. For instance, let’s say we are searching for the person who has drawn a picture. We can’t randomly pick up a painter, and accept that he has drawn that picture simply because he has the capability to draw that picture. I wonder if it is sufficient to see a painter standing before the picture for claiming that he has drawn that picture. It is not! Don’t you think so? Because, in order to be able to accept him as the painter, it is also necessary for the painter to do it in person and he is seen while painting it, in addition to having the capability and being seen standing before the picture. But this rule is applicable to material causes. We will examine the exceptional situation of the causes which can have affect without having any contact, such as “divine will” in the third point separately. There are examples of these in his material world as well. That is to say, there are affecting causes, which can carry out their processes, without touching anything, which are invisible and can’t be seen by our eyes and the creator is not the sole owner of that characteristics. As we had already said the fact that someone is standing in front of a picture while it is being painted does not provide any evidence for the painting of that picture by that person. What if the man standing before the picture is someone who is not a painter and he has nothing to do with art, does not have any capacity to draw a picture, and he is a blind and crippled man without hands! Think of it. Another man comes out and feverishly claims that this blind and ignorant man is the painter of the picture just because he stands before the canvas! He holds the hand of that guy and says that “This man has painted that picture”. Just like this example, any living thing which is created artfully is being created/formed together with some accompanying causes. However, the fact that they are co-existing at the same time, and that its formation is conditioned on the existence of the causes could not be a sufficient evidence by itself for the invention of that artful objects by the causes. Yes, the existence of an object could be dependent on numerous conditions. It is not possible to claim that a condition is enough by itself for the existence of an object just because lack of it leads to the nonexistence of that object. In other words, a simple condition for a thing is not the “real reason/cause” of that thing. The appearance of the images on a television is dependent on the condition of a switch button being pressed. However, believing that it is the magical switch what makes this television work is something that could be done, by someone who is unaware of the existence of factory producing that TV, the electronic engineers and numerous parts making up the television, that is to say, the civilization. Or at best he or she could be considered as a thoughtless person. Personally, we do not have any enmity against any atheist. We just claim that these ideas do not behoove human dignity and intelligence. Besides, we state that trying to explain the existence of the matter/ objects with causes and nature is no different from the situation of that ignorant man who is unaware of the civilization. Because, standing blatantly against wonderful divine might and daring to explain with simple and unconscious causes, the living machines which are built with enormous science and technology, and which function with the program of spirit does mean hundred time more ignorance and being away from civilization which represent all of the thinking, art, science and technology products than believing in this nonsense of magical switch button. Isn’t it much more primitive than this example? It occurs to our mind that, maybe, the real psychological (not scientific) reason behind the persistence of some scientists in making such false claims is their delirium stemming from attributing the creativity to crippled and ignorant causes compulsorily. Third point: It is necessary to check whether there is a visible concurrence between cause and effects while the object is being formed and the event takes place. Second Situation: it may not be possible to observe some causes being in the same space with the effect and having a direct influence over it. You can’t see it with the naked eye. Such as gamma rays, electric current, gravitational force and electromagnetic force. In such situations, the fact that there is no visible concurrence does not prevent the real cause-effect relationship. Perhaps, the real cause is off the stage, behind the curtains and it is a secret handler out of sight! How can we know the existence of such causes? For example, how do we know the existence of electric current? Have a look, your computer, television and electric heater are functioning. There is something that activates them. Why don’t we say, “I don’t see the electricity so there is no such thing like electricity.”? Because we know and see its effects on the objects. But, let us have a look at how have the scientific explanations been formed? When we try to explain a formation with electromagnetic force, we again turn back to the beginning point. Have you noticed that? Moreover, electromagnetic force is both invisible and an unknown whose real essence/nature is now known. The scientific explanations of the electromagnetic force lead us to points which are even more complex than our initial point! Then shouldn’t we ask how scientific is such an approach? Anybody who pays some attention could understand that this justification made by Dawkins is far from being scientific. He or she can clearly see whether the idea that there is a creator of the matter/objects is acceptable or not and whether this idea is prone to being scientific or not. For instance, the lines that we write here are seen on the screen of the computer. But, it is not this screen which is writing them. These are written by the hands of a person who is off the screen and who is using the keyboard. However, if you had been able to show this screen to a person two hundred years ago, he would have thought that the screen was something which could exert an effect. You can expect this from him. He is not aware of the technology. An atheist is neither aware of divine technology. He has such a primitive brain. (Please check out the following intermediary note). Then why does he think so? Because these lines appear on the screen, they are seen on the screen! “Intermediary Note on the term “Primitive Brain”: You should not deduce an insult from this expression. As we have mentioned before, we should not be against people but ideas. Besides, all of us, as a whole humanity, are like primitive humans in understanding the secrets of the universe just by using our intellect without using the guidance of divine revelation. None of us is different from others. The difference reveals itself in terms of contriving to make use of the guidance of divine revelation and of realizing the insufficiency of relying just on your own intellect. What should we do if we want to examine this event on the basis of intellect and logic? In this situation, we should check whether this screen itself has the capacity to write something and to make deductions from this. It is so simple. Couldn’t a man with the simplest mind, living in our contemporary world, do this? Of course, he can do it. However, a professor coming from the past, two hundred years ago, can’t do it because he is not aware of the technology. However, a five years old kid living today can make this deduction. There is such a striking difference. It can be said that existence of the cause/source of the writing outside the screen and the appearance on the screen of the writings with the help of invisible electric signals sent from the computer, which do not have a material body is a spiritual/immaterial cause for a person who is watching this event from inside the screen, because the real cause is not seen by naked eyes. Imagine that, there are small persons inside the screen like we have in cartoons. We ask you to pay attention to this very important detail. Hence, the shape of the matter could be changed with the material effect of a cause, like electricity, which could be considered as nonmaterial (spiritual) since it can’t be seen with naked eye, but it can be detected with its effects and work and therefore, its existence can be judged although we are in a material world. The work carried out by this force is explained by giving it a fancy name like electricity. How do we know its trueness? There are effects caused by it and concrete works carried out by it. These can be determined. Therefore, its existence has been accepted. Why shouldn’t the same thing be possible for the creator? Why couldn’t the existence of the creator have a place in the world of science as a scientific model or an alternative scientific interpretation? Is making an inference about the creator so irrational and illogical? Therefore, the effect over the particles of the matter, of the hand of a divine might, which is not the same kind with the matter and which does not exist materially within the universe, could be the nonmaterial (spiritual) and the real reason of the creation and formation of the matter/objects. Just as that screen is only a place of appearance for writings; the universe is a three dimensional, high definition giant screen where the writings of the pen of the almighty appear. Then, the writings in the screen are all matter/objects which are given shape in an orderly and artful manner. The basic particles of the matter, atoms, are like the ink on the point of the pen. It takes its form with the direction of the divine power. “Their lifelessness”, that is, the inability of those who are not even aware of their own existence, to be able to foresee the formation which was not existing before and which they do not own themselves. If we are told: “You claim that the matter is not created by the causes. In fact, we also say the same thing. Matter/objects are formed/created as a result of these causes”. But, in addition to that, we also say this: “The matter/objects are not created by these causes. Someone else is creating the matter by using these causes”. There is a substantial difference between these two expressions. If someone claims: “I have painted that picture!” Then, we can ask “What is your evidence? Do you have a talent for that? Were you standing before it when that picture was being painted? Do you have any witness? Or, if someone claims: “This picture is painted by so-and-so” Then the following is the first question that should be asked to that person: “Does that person who you claimed painted the picture, have a talent for painting? Was he before it during the painting or was he seen while painting that picture?” If he has not such a talent, how can it be claimed so? Somebody who does not have any talent for painting stands before the canvas. He is a blind, deaf, lame, ignorant and talentless person. And someone, who took that man by his hand and brought forward, claims “This man has painted that picture!” Why? “He stands before the canvas!” His being before the canvas is not sufficient; does he also have the knowledge and the talent for making that picture? This is what we look for. If he hasn’t got it, then we will seek another reason. In a similar way, the existence of nature and the material causes together with the objects is not sufficient Although they do not have the knowledge and talent for making that object, they can’t claim to be the inventor/the creator of that object just because they are in its vicinity. Therefore, it should be accepted compulsorily that there is someone else employing them. Accepting that the living things which are million times more wonderful and which have such a developed and artful structure that they could only be brought into being with the design capability of a superior mind, as formed by “great natural factors that scatter and mix anything coming across their way” is delirious and illogical. If multiple parts come together and form an orderly single structure, then, of course, they must be coming from a single hand centre, factory and plan. Here, the expression of “coming from single hand” should be understood as the judgement of single willpower, and not coming from different hands which are working independently of each other. There are many people working in the production process of a car. But, in its real sense, there is a one producer company. Those who are working in the production are working under the command of a single company. And just like this example, the different material causes that are independent from each other, let alone working in harmony, should result in an insolvable chaos and confusion at every place they stay together, due to their intention to act independently, because no one among them has the capability to bring others together and to manage them with a view to working for a common target. Therefore, they would make their intervention in the material randomly as they are far away from working together as a team. In that case, they would be incapable of bringing into existence a single living thing in its entirety and make it function. It can be said that “What are you talking about?. Here, it seems that, these materials make these living things just before our eyes in an orderly and they make the existing organism function continuously. And you ask how this happens. Here it just happens!”. Our answer would be this: Yes! Superficially, it appears so. But No! It should not be like that and could not be. When it is analysed carefully, it can be understood that these causes lack an orderly capability to produce and operate living beings and it is certainly found out that they are employed like factory workers who get orders from a single centre and that they do not operate independently. This result is not something that can be seen visually. It is not a completely theoretical and technical interpretation, but a strong opinion and a logical inference. It is a conviction clearly seen and judged by the mind. Then, we should ask this question: What would be the situation of natural causes; whose basic characteristics are being blind, deaf, ignorant, lifeless and unconscious, and which are thought to be moving randomly and irregularly when observed one by one; in an environment where they are mixed and brought together under normal conditions? *And, whatever they do, they choose the shortest way, the easiest manner and most beneficial form and hence achieve the visible steady state of the matter (Please look at the intermediary note below); and they create and orderly and artful living being. *And they are able to function continuously in the body of that living thing? We think that such wrong thoughts (that is, thinking that artful and designed material/objects are self-created with lifeless, ignorant, unconscious material causes and with laws of nature, which are in fact abstract concepts) could only stem from insistence in not accepting the supernatural creator, who is the real master of the matter and that such thoughts do not behove science which is the real truth seeker and that it is not possible to explain the existence of the universe with these thoughts. I wonder whether this beautiful universe, which is a paramount, magnificent and lively picture by which our minds are amazed just like everyone else, does not deserve an explanation concomitant with its beauty and excellence. Magna Anima of the humanity wants a correct and satisfactory answer explaining the (existence/creation of) this universe. We think it is very “Natural” that supernatural events have “Supernatural” explanations and we find the answer to these big questions in the existence of “The Eternal Artist” who paints the picture of the universe on the canvas of nature with the ink/paint of particles and we appreciate Him respectfully. We see that it as our most basic human duty to respond to his honouring us with the possibility to watch his great work with admiration, to his making us a thoughtful addressee to Himself, by knowing Him and to making Him known and we accept this. We grovel to Him, with gratitude and satisfaction in the face of his graceful treats and with admiration and affection before His magnificent reign. Now, as a result of our detailed analysis, we tell you our conclusion, interpretation and opinion obtained from all these scientific data, our examinations what we saw in nature and our detailed researches. Even trying to envision that admirably interesting, decisive activity of the matter, which is determinable, measurable and stable at the level of Newtonian Mechanics is taking place on its own without any external intervention is fantasy far beyond the limits of mind and imagination, absolutely abortive science-fiction, and it is making up an unreal story in the name of science! Tags: 2. Uluslararası Yaratılış Kongresi, A Journey of Discovery for an Extraordinary Treasure: Risale-i Nur (The Treatise of Light) Training Program, ateizm, bediüzzaman said nursi, bilim din felsefe ilişkisi, canlılığın oluşumu, Coincidence and Material Causes, ediz sözüer, Explanatory Texts for Risale-i Nur (The Treatise of Light), Intelligent Design, International Congress of Creation, laws of nature, Medresetüzzehra Eğitim Yaklaşımı, Nature, risale-i nur, Risale-i Nur (Treatise of Light) Training Program, Risale-i nur dersleri, Risale-i Nur Explanatory Works, risale-i nur eğitim programı, Risale-i nur izah, Tabiattaki Maddî Sebepler, yaratıcı, yaratılış, yaratılış kongresi | Permalink.